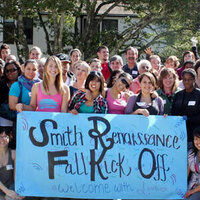 The alumni/ae-initiated Smith Society serves students who come from adverse circumstances and lack the usual family support -- former foster youths, those whose parents are in prison, mental facilities, or have been deported, orphans, or those who experienced major periods of homelessness growing up. Our aim is to help them thrive. Each year Chancellor Blumenthal and Kelly Weisberg host a reception to show their support. Having served hundreds, this year we celebrate our twentieth anniversary and say a grateful farewell to the Chancellor and his wife as his chancellorship comes to an end.